Learn about the rich history that makes this bridgeless island so significant, and meet the Daufuskie Island artisans. Allow our local guides to take you through a back-in-time experience on a historic, quirky, rustic, under-developed and relatively unknown island. On this very popular guided History & Artisans tour, you will learn about the rich Gullah, American Indian, and Civil War history that makes this bridgeless island so significant. You’ll have the opportunity to stop at the Billie Burn Historical Museum which houses artifacts found on the island such as arrowheads and pottery shards. Famous author Pat Conroy spent a year on Daufuskie (or “Yamacraw Island”, as he called it) teaching at the Maryfield School, which is a popular stop for visitors. Another popular highlight of the guided tour will be our visit with the Daufuskie Island landmark artisans. These independent and creative minds have made quite the splash for being hard-to-get-to galleries. They have been collectively covered in national and regional magazines such as Coastal Living, Southern Living, Martha Stewart Living, Charleston Home, South, Charleston, Hilton Head Monthly, and more. Chase Allen of The Iron Fish Gallery & Studio (est. 2001) won the 2014 American Made Audience Choice Award hosted by Martha Stewart. Chase has become known for his coastal sculptures that have been shipped all over the world. Lancy & Emily Burn’s Silver Dew Pottery(est. 1996) create beautiful unique pottery which is modeled after American Indian pottery found on Daufuskie Island. We now have newly welcomed artisans Mike Loftus & Tony Chase. Tony and his partners joined together and formed The Daufuskie Island Rum Company where they have been distilling delicious rum on Daufuskie Island since 2014. 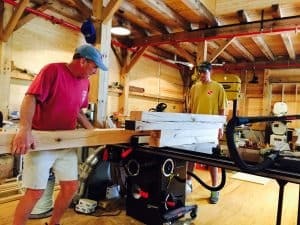 Mike Loftus handcrafts exquisite wooden boats at his timber framed Daufuskie Wine and Woodworks(est. 2015). He and his wife also provide a selection of local wine and beer. Daufuskie Blues offers beautiful indigo-dyed fabrics housed in the historical Maryfields School. For handcrafted soaps and body care products with an island flare, visit Daufuskie Peach. Your guided tour throughout the historic dirt roads of Daufuskie Island will no doubt help you grow an appreciation for true island lifestyle. This 2.5 hour tour will give you a broad understanding of who has inhabited Daufuskie Island over the years and you will also get a glimpse in to how Daufuskie Islanders exist today on a remote island.